2015 TLX trunk light bulb replacement procedure? 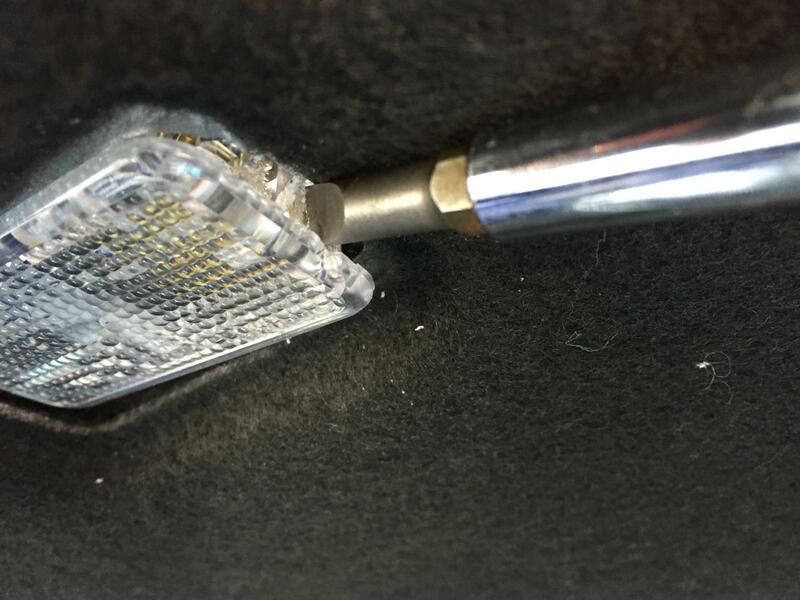 I'm almost embarrassed to ask about this procedure at all, given its relative simplicity, but the trunk light in my 2015 TLX v6 has burned-out, and I'm wondering what, exactly, is involved with replacing it. From a cursory glance, it looks like I'll have to remove the trunk liner and then simply pry loose the trunk light housing and replace the bulb. Is there "anything to know" about the plastic grommets that hold the felt trunk liner in-place? Shall I simply pry them loose with a plastic prying tool? Might anybody know exactly how many of them need to be removed, and if any of them are "hiding" in odd locations? I bought the Sylvania 168ZEVOLED-2 bulbs, and some bulb grease. Any general guidance, advice, or links to existing how-to resources are much appreciated. First, skip the bulb grease.... second I don't think the liner has to be removed but just gently pry off the light lens cover. When prying it you would do that from the passenger side. MrMoo, Gonzo and cbj4074 like this. Unfortunately, replacing the bulb did not resolve the issue. My hunch now is that the first bulb is perfectly fine, and the issue lies elsewhere. What are the other possibilities with regard to the light refusing to come on when I open the trunk? Should I check the corresponding fuse? Or is it possible that the light assembly itself is somehow damaged and needs to be replaced? I'm just not sure what constitutes "continuity". Maybe somebody else knows what we're looking for here with regard to "continuity" between the terminals. It seems obvious that the word "continuity" implies a connection between the terminals, but I'm not electrical engineer. Is this something that can be determined visually, or do I need to use an multimeter or something (I do have one)? I'd check the corresponding fuse, too, but I can't figure out which fuse is associated with the trunk light. Page 108 of my Owner's Manual, which lists all the fuses, says nothing of the trunk light, specifically. The closest thing I see is "9 Interior Lights 5 A". But all the other interior lights work fine, so I'm skeptical that this is the corresponding fuse. Any ideas? Thanks again for the assistance; I appreciate it sincerely! Check "continuity" means to use a multimeter to check the Ohms in the circuit. Put the Red Probe on the "+ Pin" and the Black Probe on the "- Pin" and check the Ohms reading. 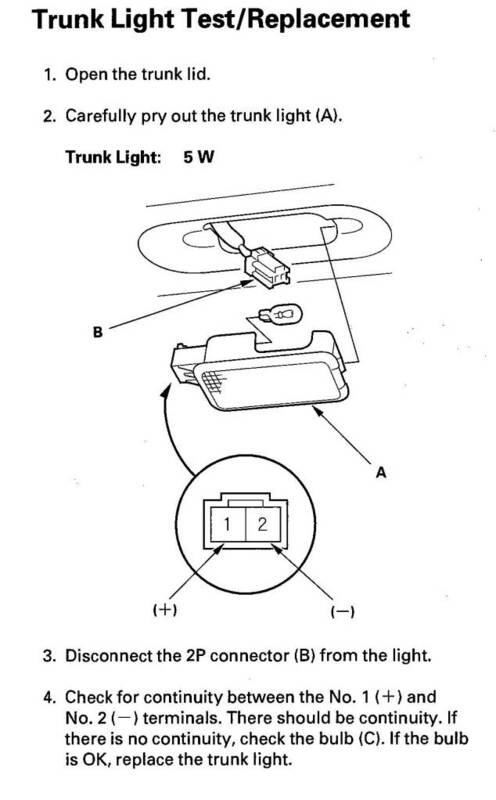 If it reads "1" then you have an "Open" circuit and need to replace the complete Trunk Light. Silly question, is the interior light set to auto or on? If it's set to off I believe it effects the truck light operation too. Thanks so much, mdd2018tlx. That does help! I don't think I'm able to post links without moderator approval yet (due to my post-count), but the unit is an Actron CP7665 and the manual is available on its product page, if you don't mind having a look. I just want to ensure that I have the dial on the correct setting for a continuity test. In any case, when I touch the probes to the leads on the light assembly, the reading remains "1", so provided I'm doing this correctly, I do indeed appear to have a busted trunk light. I'm not sure which lead is + and which is -, but the reading is still one even if I swap the pins. If it's helpful, the wires on the female/plug side are pink and yellow, with pink on the left when looking "down" at the light from above, as it would be oriented when installed. And Gonzo, to answer your question, the interior light is set to Auto, and the other interior lights come on as expected when I open either door. Good call, though! That,->| is for a DIODE. Also, make sure the bulb is properly installed at the time of testing. NO bulb will always test as an open circuit. Thanks again for the very helpful guidance, Mike. With your advice, I followed the instructions on page 9 of my multimeter's manual and am still seeing "1". If I'm not mistaken, the correct replacement part is https://www.oemacuraparts.com/oem-pa...ns-34261s5a003 , and is about $15. Provided the part is in fact broken, what would cause that? Is it the little capacitor/resister/whatever it is (the little black cylinder marked with "40") that has failed? The rest of the part seems so simple that it would be unlikely to fail out of nowhere. All said, I suppose I'll order the replacement part and see if it solves the problem. I'll report back once I know more. Did you test for voltage on the lines? If so that part might be the issue... if no voltage then the part is not the issue. That's an excellent point, and no, I had not. Any general guidance as to how I should test that? Is the idea basically to use the multimeter and touch the red probe to the positive side of the lead inside the plastic connector and the black probe to the negative lead?